Mastered for vinyl by Patrick W. Engel at TEMPLE OF DISHARMONY in March 2017. Starting in 1979, the New Wave Of British Heavy Metal was a singular movement sweeping through England, Scotland, Wales, Northern Ireland and even remote place like the Channel Islands (with Pete Haworth’s Legend being the main protagonists on Jersey) and Gibraltar (do yourself a favour and check out Oracle). Originally formed in the late 1970s, Venom from Newcastle upon Tyne were also classified as NWOBHM. A fact Cronos (bass, vocals), Abaddon (drums) and Mantas (guitar) always strongly denied. Actually, Venom did not like to be classified whatsoever, whether people called them NWOBHM, Speed Metal, Thrash Metal or anything else. That’s why they invented a whole new subgenre with their second album »Black Metal« in 1982. It took a long time for Venom from those early gigs in church halls up in the North East of England to reach the biggest stages of the country. But in the end they did. When Cronos, Mantas and Abaddon finally arrived at the Hammersmith Odeon in London on their “Seven Dates Of Hell Tour” on June 1st 1984, even England had caught up with Venom. 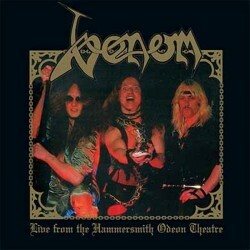 Just shortly over a year later Venom once again entered the stage of the legendary Hammersmith Odeon Theatre. What you hold in your hands is the entire performance of their October 8th 1985 appearance: »Live From The Hammersmith Odeon Theatre«. Mastered for vinyl by Patrick W. Engel at the Temple Of Disharmony in March 2017. So join the legions and enter the very depth of hell!